We present historic discoveries and important observations, related to oxygenic photosynthesis, from 1727 to 2003. The decision to include certain discoveries while omitting others has been difficult. We are aware that ours is an incomplete timeline. In part, this is because the function of this list is to complement, not duplicate, the listing of discoveries in the other papers in these history issues of Photosynthesis Research. In addition, no one can know everything that is in the extensive literature in the field. Furthermore, any judgement about significance presupposes a point of view. This history begins with the observation of the English clergyman Stephen Hales (1677–1761) that plants derive nourishment from the air; it includes the definitive experiments in the 1960–1965 period establishing the two-photosystem and two-light reaction scheme of oxygenic photosynthesis; and includes the near-atomic resolution of the structures of the reaction centers of these two Photosystems, I and II, obtained in 2001–2002 by a team in Berlin, Germany, coordinated by Horst Witt and Wolfgang Saenger. Readers are directed to historical papers in Govindjee and Gest [(2002a) Photosynth Res 73: 1–308], in Govindjee, J. Thomas Beatty and Howard Gest [(2003a) Photosynth Res 76: 1–462], and to other papers in this volume for a more complete picture. Several photographs are provided here. Their selection is based partly on their availability to the authors (see Figures 1-15). Readers may view other photographs in Part 1 (Volume 73, Photosynth Res, 2002), Part 2 (Volume 76, Photosynth Res, 2003) and Part 3 (Volume 80, Photosynth Res, 2004) of the history issues of Photosynthesis Research. 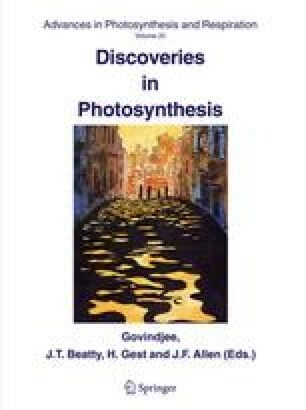 Photographs of most of the Nobel-laureates are included in Govindjee, Thomas Beatty and John Allen, this volume. For a complementary time line of anoxygenic photosynthesis, see H. Gest and R. Blankenship (this volume). Choice of first names used in this paper is arbitrary: authors have used formal first names, nicknames, or just initials, depending on their availability, or their own preferences.